Herbal Cough Remedies. Learn natural herbs for cough remedy and more. Discover herbal cough remedies for all kinds of coughs - the short lived and the tough ones, too. Come learn about herbs for cough and their benefits, get recipes and more. Don't let those coughs get the best of you! Long ago I used to not think that much about coughs. I just never really got them. When I gave birth to two little boys the coughs started coming in. I initially would worry about them and wonder if those coughs would ever take a hiatus until I learned that a cough is actually a good thing. I went on a quest to find all the natural cough remedies I could find to not only treat a cough but help support a person's whole body before, during and after a cough. One of the things I discovered is that a cough is simply a symptom of clearing the throat of anything from pollen to smoke to dust to bacteria. And thankfully there are simple herbal cough remedies for them, too. First, let's take a look at the benefits. The benefits of herbal cough remedies start with slowing down and trusting in a longer process of healing. In our modern world we want things to get fixed and we want them now. It's easy to want to suppress a cough in the present so we can more easily function and move through our lives. When we do so, we block our body's defense mechanisms that are working hard to flush out mucus which inhibits infection. As well, we miss out on the opportunity to look deeper into what's going on with our bodies when a symptomatic cough surfaces. What has caused this cough? Track back to see how the course of your life is going that has brought about your cough. One winter I came down with a serious case of bronchitis that lasted three weeks. I took some incredible herbal cough remedies including some Chinese medicine that helped take care of it. When I was at the end of my bronchitis I slowed down to reflect on why I had gotten this gnarly cough in the first place. I realized that my body was telling me it needed strengthening. So I finished the cycle of healing by drinking large volumes of bone broth and nettle tea. Another benefit to herbal cough remedies is that you have the opportunity to make them yourself. It's incredibly empowering to be your own doctor and healer in this way. When a cough comes on, you've got immediate natural cough remedies available at your fingertips. So many cough syrups sit on the shelves in stores for a very long time. By making your own natural cough remedies you can track their shelf life. I'll be giving you some simple herbal cough remedies that don't require a lot of time to make so hopefully you'll be able to make them yourself and take them when they are fresh and potent. By making your own herbal cough remedies you are putting yourself in touch with the medicine plants themselves. Your knowledge of medicinal plants will grow and expand and you can respond that much more quickly when a cough appears. You'll gain trust and confidence in yourself when you are able to heal yourself and trust in the process of healing that your body naturally knows how to do. Down the road, you may even become a resource to help others when they get a stubborn cough that just won't go away. Lastly, herbal cough remedies are often significantly less expensive than conventional medicines you'll find in grocery stores. Natural cough remedies don't contain artificial flavorings, colorings and chemicals that you might find in other medicines. They will help treat your whole being as they sooth the cough. There are many different kinds of coughs with endless subtleties. You can differentiate them by sound and severity. And because there are so many influencing factors, the cough can change over time. It's important to respond to a cough as soon as it makes its first appearance. From the harsh barking cough to the tickling teasing cough in the back of your throat you'll find a wide spectrum of coughs in the human experience. And because there is a wide range of them I am going to give you herbal cough remedies that address the most standard, run of the mill coughs as well as the colds and sore throats that so often accompany them. In this article you'll find natural cough remedies that are treating coughs at this level. As far as herbs for cough go, these four herbs are excellent. They not only help soothe and heal a cough, they are great for sore throats, colds, and inflamed or stressed throat or lungs. They can be made into a variety of herbal cough remedies, including tinctures, infusions and decoctions, syrups, cough drops, and more. 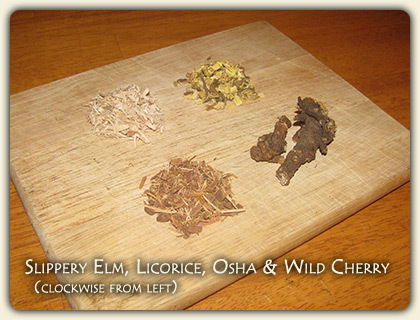 Slippery Elm Bark (Ulmus rubra): A very soothing herb for sore throats and inflammations and blends well with licorice. It goes great as a tea with cinnamon, too! Licorice root (Glycyrrhiza glabra): This is one of the most delicious and tasty herbs for cough. Thus, it has been given the name "sweet root" for good reason. It treats coughs, sore throats, an inflamed bronchial tract and many other ailments. Osha root (Ligusticum porter): This is a very powerful herb that is also known as "cough root." It is good for irritating coughs, bronchitis, and pneumonia. It helps coat the throat and helps coughs become productive. Wild Cherry Bark (Prunus avium): This herb is excellent for calming down those wild and unwieldy coughs. It is the inner bark that is used for cough medicine and is often found in conventional medicines as well. In a stainless steel pot, boil ginger for 10 minutes then lightly simmer for 30 minutes. Strain and discard ginger pulp. For every cup of liquid left add 1 ½ cups brown sugar. Simmer again until thick. Pour into a greased pan spreading out mixture so that it is 1 inch thick. As it cools, cut cough drops into small pieces and roll into balls. Lightly dust with confectioner's sugar. Store in airtight container once cool. Grind up dried dates and walnuts. Add nut butter and honey or syrup in equal amounts until it is very thick and holds together well. Add in coconut, carob powder, medicinal herbs, and peppermint oil and mix well. Roll into balls. You can roll or coat in another layer of carob or coconut if desired. Store in refrigerator for a few weeks. Boil water and pour over herbs. Steep for one hour. Add essential oil. Pour into a small spray bottle and spray into the back of your throat for comfort or a boost to your throat! Simmer 3 quarts of water with medicinal herbs until you have 1 pint left. You now have a very strong tea. Strain herbs and add honey, glycerin or syrup. Warm sweetener and tea together until well mixed but do not cook or boil honey. Refrigerate if you plan on keeping this for several weeks. Take as needed. Put white pine bark in a glass jar. Cover with boiling water. Once cooled, add whiskey. Completely cover and let steep overnight. Shake occasionally. The following day strain the bark from the jar and add honey. Mix well. For adults, take 1 -2 Tbsp. and for children take 1 -2 tsp. or as needed. 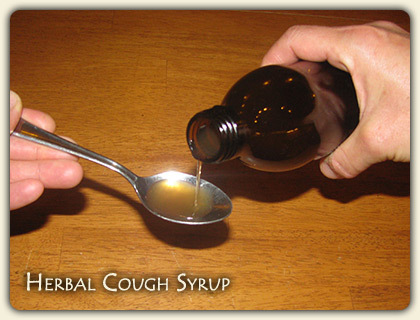 This cough syrup will last indefinitely without spoiling and is a very effective cough syrup! Using a mouthwash when you have a cough can be very supportive to keep your mouth clean. Mix water and vodka. Add tinctures and essential oil and mix well. Dilute 4 - 5 Tbsp. of your concoction in water. Use as needed. ** A note on using alcohol in medicines: while there is much controversy and scrutiny over using alcohol at all as a beverage for consumption, it has been incorporated into medicines for thousands of years in many cultures around the world as far back as the Sumerians and Egyptians. Using alcohol in medicines is one of the most safest ways a person could use it. Alcohol has been used medicinally in a variety of different ways from preserving to cleaning wounds to counteracting poisoning to reducing dramatic pain. Using alcohol in medicines is a demonstration that we are using this substance wisely, conservatively and for a good purpose. A classic example of a medicine with alcohol would be an herbal tincture. There is very little of it being used initially and the alcoholic content actually evaporates over time if instead of capping the jar tightly while it sits for 3 - 6 weeks you put a mesh screen over it and occasionally stir it with a spoon instead of shaking it. When in question about giving medicine to children with alcohol in it, glycerin syrup is a great alternative when making medicines for children. Combine all ingredients and gargle with as needed. Here are some great secondary herbs for cough that are wonderful for concocting a medicinal tea. These herbs will help sooth a cough and your throat. The process is simple. Put 2 tsp. fresh or dried herb in 1 cup boiling water. Steep for 20 minutes. You can also add a tsp. or two of honey to help coat your throat. There's a lot to learn about coughs. I've learned so much about them since I first started my quest. I have skills, tools and herbal cough remedies to help heal a cough and so can you. Here are some great books that will help you continue exploring natural cough remedies as well as many other health issues. Enjoy! Interested in being personally mentored in Herbal Remedies & Medicinal Plants, on a transformational journey of connection to nature, community, and self?